Breast augmentation is usually performed to enhance the size and shape of a woman's breasts. Surgery can often improve an individual's self-image. Historically, breast enlargement was accomplished by 1 of 4 methods, with varying degrees of success. Inert materials such as silicone or paraffin have been injected directly into the parenchymal tissue to increase breast size. This method was abandoned because of the exceedingly high incidence of acute and long-term complications. Granuloma formation frequently occurs with this procedure, as well as skin loss and scar contracture, producing disfigurement. Autogenous tissue injections also have been used in an attempt to enhance and enlarge the breast shape. Autogenous tissues, including omentum, fat, muscle, lipomas, and skin, in the form of dermis or dermal fat grafts, have been used to enhance and enlarge the breasts. Results from injection of autogenous tissue have lacked predictability. In addition to the risks of scarring and uneven texture that may be visible in patients who have undergone tissue injection into the breasts, microcalcifications may develop. This makes performing follow-up mammography on these women for early diagnosis of breast cancer difficult. Recently, a suction pump device was used to attempt to enhance the breast shape. However, while some enlargement was noted, the overall aesthetic shape in these individuals was lacking significantly. Implants filled with a substance can be placed to enhance and enlarge the size of the breast. Both saline-filled and silicone-filled implants have been used since the 1960s to enhance and enlarge women's breasts. Initial silicone implants in the early 1960s had a thick elastomer shell and were filled with a relatively firm silicone gel. In the mid 1970s, silicone implants tended to have a thin elastomeric shell and a less viscous gel, though gel cohesiveness was varied. Over the years, modifications have been made to implant shape, shell texture and properties, and the substance with which the implant is filled. Implants can be round or teardrop-shaped. Round implants are disc-shaped and exhibit equal fullness in all 4 quadrants of the breast (see the image below). Round implants come in a variety of projections, with the different projections affecting the final shape of the breast. Projections include moderate profile, moderate plus profile, high profile, and ultrahigh profile. The greater the height of the implant (profile), the narrower the base diameter. Higher-profile implants provide more upper pole fullness to the breast and greater lift. (Above) Preoperative view of 28-year-old woman with micromastia. She has had 2 children. 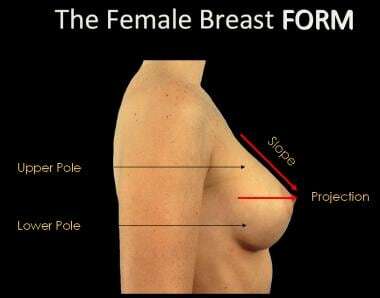 Note the small breast has decreased upper pole fullness. (Below) Postoperative view after submuscular augmentation with a round implant. Notice increased fullness of the upper poles of the breasts. Submuscular placement makes it difficult to appreciate the edge of the implant. Teardrop-shaped implants (also called anatomic implants) exhibit reduced augmentation fullness in the upper pole of the breast and increase fullness in the lower half of the breast (see the image below). These implants are narrower than rounded implants at the superior and inferior poles. In some cases, implant rotation can be a problem with teardrop-shaped implants. (Above) Preoperative view of 26-year-old woman with minimal upper pole fullness and asymmetric breasts. (Below) Postoperative result after submuscular placement of anatomically shaped implants. Notice increased lower pole fullness and absence of upper pole fullness relative to the round implant. The 2 major implant companies, Allergan and Mentor, both have obtained US Food and Drug Administration (FDA) approval for the sale and clinical use of shaped silicone implants. A new company, Sientra, has been licensed to provide standard-shaped implants and shaped implants. Over time, however, polyurethane underwent microfragmentation and phagocytosis. In addition, the polyurethane could break down and dissolve within the local tissue after implant placement. An intense foreign-body reaction with numerous macrophages and multinucleated giant cells occurred in the capsule in some patients who had this type of implant. Because of these problems, polyurethane-covered implants were removed from the market. In an attempt to duplicate polyurethane’s potential protection against capsular contracture, implant manufacturers increased the shell thickness of standard saline and silicone implants with surface texturing. Unfortunately, shell texturing has not conclusively decreased capsular contractures in patients undergoing breast augmentation. Increased wrinkling due to textured implants has been reported. In the late 1980s and into the 1990s, multi-layered shells were developed. These have a barrier layer to reduce silicone leakage from the implant. The alteration in the elastomer shell composition was accompanied by the introduction of a firmer gel. The firmer gel has multiple crosslinks between the silicone molecules to obtain a cohesive effect, which reduces the capacity of the gel to migrate significantly if the integrity of the shell is compromised. Silicone implants were first used in 1964, when reported by Cronin and Gerow, and they are still used for breast augmentation today. The advantages of silicone-filled implants include the minimal solubility of silicone and favorable viscosity of the material, which, together, provide a natural feel. The initial silicone implants were composed of a thick outer elastomer shell that was then filled to variable volumes with a silicone gel. Problems associated with silicone implants include capsular contracture, granulomas that develop following leaching of silicone from the implant, and migration of silicone into the axilla. In 1992, the Food and Drug Administration (FDA) temporarily removed silicone implants because of a purported increased incidence of autoimmune phenomena. Saline implants had also been in use since the 1960s, but the removal of silicone implants from the market in 1992 increased interest in saline implants. The advantages of saline-filled implants are that saline poses no risk to patients and is safely absorbed into the bloodstream if the integrity of implant capsule is compromised. Some studies report that saline implants have a decreased capsular contracture rate compared to silicone implants. However, saline has slightly decreased viscosity compared to silicone. The initial use of saline implants has resulted in a high incidence of deflation (approximately 10%). Over the last 10 years, implant manufacturers have significantly improved the integrity of implants; specifically, the reliability of the valvular mechanism for introduction of saline into the implant. Late deflation of saline-filled implants, however, remains a significant issue. After having been removed from general use by the FDA, silicone implants were exhaustively studied and have been shown to have low complication rates comparable with or, in some cases, lower than those of saline implants (see discussion below). The reported autoimmune responses were discredited by numerous exhaustive long-term studies that failed to demonstrate increased incidence of long-term problems in large numbers of women who underwent augmentation with silicone implants. In 2006, the FDA approved implants filled with silicone gel (from Mentor Corporation and Allergan) for augmentation and reconstructive purposes in the United States. Silicone implants were never removed from the European market. For complete information on the silicone safety, see Medscape Reference article Silicone Breast Implant Safety and Efficacy. Implant companies have begun to offer altered types of silicone gel with increased cohesive properties. Severe ptosis is a relative contraindication to surgery. Women with significant ptosis may require a mastopexy concomitantly or as a secondary procedure. Women with tubular breasts also are at significant risk of secondary procedures after the augmentation to correct residual deformities. As with any surgery, severe associated medical conditions need to be evaluated on a patient-by-patient basis. Heidekrueger PI, Sinno S, Hidalgo DA, Colombo M, Broer PN. Current Trends in Breast Augmentation: An International Analysis. Aesthet Surg J. 2017 Jun 7. [Medline]. Ellenberg AH, Braun H. A 3 1/2-year experience with double-lumen implants in breast surgery. Plast Reconstr Surg. 1980 Mar. 65(3):307-13. [Medline]. McKinney P, Tresley G. Long-term comparison of patients with gel and saline mammary implants. Plast Reconstr Surg. 1983 Jul. 72(1):27-31. [Medline]. Slade CL, Peterson HD. Disappearance of the polyurethane cover of the Ashley Natural Y prosthesis. Plast Reconstr Surg. 1982 Sep. 70(3):379-83. [Medline]. Cronin T, Gerow F. Augmentation mammoplasty: A new "natural feel" prosthesis. Broadbent TR, ed. Transactions of the Third International Congress of Plastic Surgery. Amsterdam: Excerpta Medica Foundation; 1964. Bondurant S, Ernster V, Herdman R, eds; Committee on the Safety of Silicone Breast Implants, Institute of Medicine. Safety of Silicone Breast Implants. The National Academies Press Web site. Available at http://www.nap.edu/catalog.php?record_id=9602. Accessed: November 9, 2009. Deapen D. Breast implants and breast cancer: a review of incidence, detection, mortality, and survival. Plast Reconstr Surg. 2007 Dec. 120(7 Suppl 1):70S-80S. [Medline]. Cunningham B. The Mentor Core Study on Silicone MemoryGel Breast Implants. Plast Reconstr Surg. 2007 Dec. 120(7 Suppl 1):19S-29S; discussion 30S-32S. [Medline]. National Cancer Institute (NCI). NCI Breast Implant Study. NCI Web site. Available at http://www.nci.nih.gov/newscenter/siliconefactsheet. Accessed: November 9, 2009. Food and Drug Administration. FDA Approves Silicone Gel-Filled Breast Implants After In-Depth Evaluation Agency Requiring 10 Years of Patient Follow-Up. FDA Web site. Available at http://www.fda.gov/NewsEvents/Newsroom/PressAnnouncements/2006/ucm108790.htm. Accessed: November 9, 2009. Benito-Ruiz J, Manzano ML, Salvador-Miranda L. Five-Year Outcomes of Breast Augmentation with Form-Stable Implants: Periareolar vs Transaxillary. Aesthet Surg J. 2017 Jan. 37 (1):46-56. [Medline]. Jones FR, Tauras AP. A periareolar incision for augmentation mammaplasty. Plast Reconstr Surg. 1973 Jun. 51(6):641-4. [Medline]. Tebbetts JB. Transaxillary subpectoral augmentation mammaplasty: long-term follow-up and refinements. Plast Reconstr Surg. 1984 Nov. 74(5):636-49. [Medline]. Pacella SJ, Codner MA. The transaxillary approach to breast augmentation. Clin Plast Surg. 2009 Jan. 36(1):49-61, vi. [Medline]. Headon H, Kasem A, Mokbel K. Capsular Contracture after Breast Augmentation: An Update for Clinical Practice. Arch Plast Surg. 2015 Sep. 42 (5):532-43. [Medline]. [Full Text]. Stevens WG, Nahabedian MY, Calobrace MB, et al. Risk factor analysis for capsular contracture: a 5-year Sientra study analysis using round, smooth, and textured implants for breast augmentation. Plast Reconstr Surg. 2013 Nov. 132 (5):1115-23. [Medline]. Hidalgo DA, Sinno S. Current Trends and Controversies in Breast Augmentation. Plast Reconstr Surg. 2016 Apr. 137 (4):1142-50. [Medline]. Tebbetts JB. Dual plane breast augmentation: optimizing implant-soft-tissue relationships in a wide range of breast types. Plast Reconstr Surg. 2001 Apr 15. 107(5):1255-72. [Medline]. Roxo AC, Nahas FX, Pinheiro Rodrigues NC, et al. Functional and Volumetric Analysis of the Pectoralis Major Muscle After Submuscular Breast Augmentation. Aesthet Surg J. 2017 Jun 1. 37 (6):654-61. [Medline]. Courtiss EH, Goldwyn RM, Anastasi GW. The fate of breast implants with infections around them. Plast Reconstr Surg. 1979 Jun. 63(6):812-6. [Medline]. Oneal RM, Argenta LC. Late side effects related to inflatable breast prostheses containing soluble steroids. Plast Reconstr Surg. 1982 Apr. 69(4):641-5. [Medline]. Asplund O. Capsular contracture in silicone gel and saline-filled breast implants after reconstruction. Plast Reconstr Surg. 1984 Feb. 73(2):270-5. [Medline]. Pfeiffer P, Jorgensen S, Kristiansen TB, Jorgensen A, Holmich LR. Protective effect of topical antibiotics in breast augmentation. Plast Reconstr Surg. 2009 Aug. 124(2):629-34. [Medline]. Khan UD. Breast Augmentation, Antibiotic Prophylaxis, and Infection: Comparative Analysis of 1,628 Primary Augmentation Mammoplasties Assessing the Role and Efficacy of Antibiotics Prophylaxis Duration. Aesthetic Plast Surg. 2009 Oct 20. [Medline]. Carlesimo B, Cigna E, Fino P, Rusciani A, Tariciotti F, Staccioli S. Antibiotic therapy of transaxillary augmentation mammoplasty. In Vivo. 2009 Mar-Apr. 23(2):357-62. [Medline]. Hidalgo DA, Spector JA. Breast augmentation. Plast Reconstr Surg. 2014 Apr. 133 (4):567e-83e. [Medline]. Spear SL, Little JW3rd. Breast capsulorrhaphy. Plast Reconstr Surg. 1988 Feb. 81 (2):274-9. [Medline]. Chasan PE, Francis CS. Capsulorrhaphy for revisionary breast surgery. Aesthet Surg J. 2008 Jan-Feb. 28 (1):63-9. [Medline]. Curtis MS, Mahmood F, Nguyen MD, Lee BT. Use of AlloDerm for correction of symmastia. Plast Reconstr Surg. 2010 Oct. 126 (4):192e-3e. [Medline]. Kaufman D. Pocket reinforcement using acellular dermal matrices in revisionary breast augmentation. Clin Plast Surg. 2012 Apr. 39 (2):137-48. [Medline]. Spear SL, Dayan JH, Bogue D, et al. The "neosubpectoral" pocket for the correction of symmastia. Plast Reconstr Surg. 2009 Sep. 124 (3):695-703. [Medline]. Voice SD, Carlsen LN. Using a capsular flap to correct breast implant malposition. Aesthet Surg J. 2001 Sep. 21 (5):441-4. [Medline]. Becker H, Shaw KE, Kara M. Correction of symmastia using an adjustable implant. Plast Reconstr Surg. 2005 Jun. 115 (7):2124-6. [Medline]. Lesavoy MA, Trussler AP, Dickinson BP. Difficulties with subpectoral augmentation mammaplasty and its correction: the role of subglandular site change in revision aesthetic breast surgery. Plast Reconstr Surg. 2010 Jan. 125 (1):363-71. [Medline]. Handel N. The double-bubble deformity: cause, prevention, and treatment. Plast Reconstr Surg. 2013 Dec. 132 (6):1434-43. [Medline]. Maxwell GP, Gabriel A. The neopectoral pocket in revisionary breast surgery. Aesthet Surg J. 2008 Jul-Aug. 28 (4):463-7. [Medline]. Lee HK, Jin US, Lee YH. Subpectoral and precapsular implant repositioning technique: correction of capsular contracture and implant malposition. Aesthetic Plast Surg. 2011 Dec. 35 (6):1126-32. [Medline]. Baxter RA. Intracapsular allogenic dermal grafts for breast implant-related problems. Plast Reconstr Surg. 2003 Nov. 112 (6):1692-6; discussion 1697-8. [Medline]. Maxwell GP, Gabriel A. Non-cross-linked porcine acellular dermal matrix in revision breast surgery: long-term outcomes and safety with neopectoral pockets. Aesthet Surg J. 2014 May 1. 34 (4):551-9. [Medline]. Maxwell GP, Gabriel A. Use of the acellular dermal matrix in revisionary aesthetic breast surgery. Aesthet Surg J. 2009 Nov-Dec. 29 (6):485-93. [Medline]. Maxwell GP, Gabriel A. Efficacy of acellular dermal matrices in revisionary aesthetic breast surgery: a 6-year experience. Aesthet Surg J. 2013 Mar. 33 (3):389-99. [Medline]. Maxwell GP, Gabriel A. Acellular dermal matrix in aesthetic revisionary breast surgery. Aesthet Surg J. 2011 Sep. 31 (7 Suppl):65S-76S. [Medline]. Becker H, Lind JG 2nd. The use of synthetic mesh in reconstructive, revision, and cosmetic breast surgery. Aesthetic Plast Surg. 2013 Oct. 37 (5):914-21. [Medline]. Voglimacci M, Garrido I, Mojallal A, et al. Autologous fat grafting for cosmetic breast augmentation: a systematic review. Aesthet Surg J. 2015 May. 35 (4):378-93. [Medline]. Maguina P, Hoffman R, Szczerba S. Autologous dermal graft in breast reconstruction and treatment of breast implant malposition. Plast Reconstr Surg. 2010 Apr. 125 (4):170e-1e. [Medline]. de Benito J, Sanchez K. Secondary breast augmentation: managing each case. Aesthetic Plast Surg. 2010 Dec. 34 (6):691-700. [Medline]. Hudson DA, Adams KG, Adams S. Autologous dermal graft in breast reconstruction. Ann Plast Surg. 2012 Mar. 68 (3):253-6. [Medline]. Center for Devices and Radiological Health, U.S. Food and Drug Administration. Anaplastic Large Cell Lymphoma (ALCL) In Women with Breast Implants: Preliminary FDA Findings and Analyses. Jan 2011. [Full Text]. (Above) A 24-year-old woman with an A-cup breast. (Below) Postoperative result after subglandular placement with 460-mL implants. Note the lower position of the implant when placed in a subglandular position. (Above) Preoperative view of a 27-year-old patient desiring augmentation. (Below) Postoperative view after augmentation with a round implant. Notice the smooth contour in the upper pole. The end of the implant is not perceptible because of submuscular placement. (Above) Preoperative view of 23-year-old patient with micromastia. (Below) Postoperative view after augmentation with detachment of the inferior half of the pectoralis musculature from the sternal attachments to provide cleavage. Note increased medial projection. The authors and editors of Medscape Reference gratefully acknowledge the contributions of previous editor, Saleh M Shenaq, MD, to the development and writing of this article.